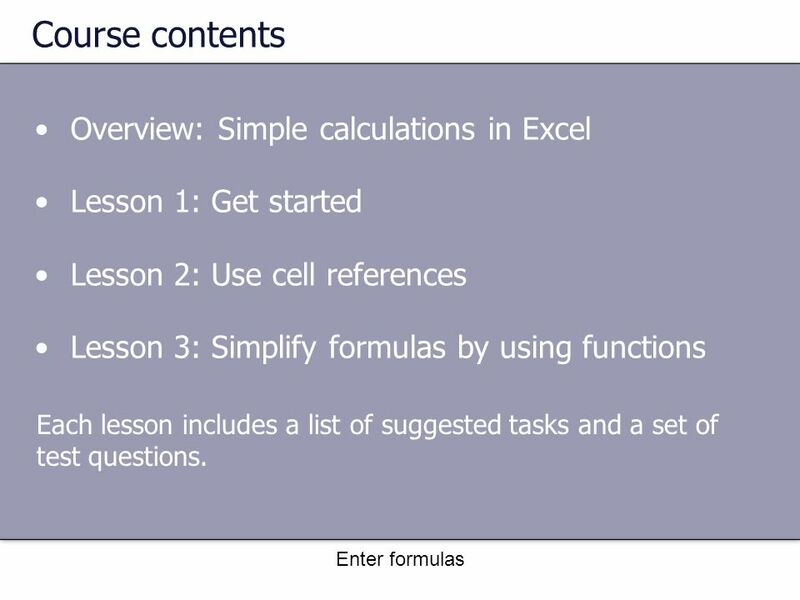 2 Enter formulas Course contents Overview: Simple calculations in Excel Lesson 1: Get started Lesson 2: Use cell references Lesson 3: Simplify formulas by using functions Each lesson includes a list of suggested tasks and a set of test questions. 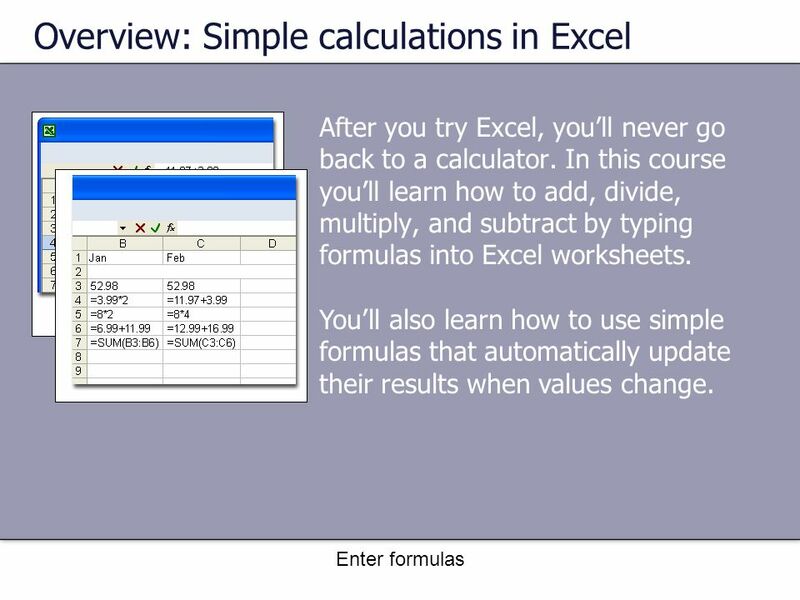 3 Enter formulas After you try Excel, you’ll never go back to a calculator. In this course you’ll learn how to add, divide, multiply, and subtract by typing formulas into Excel worksheets. 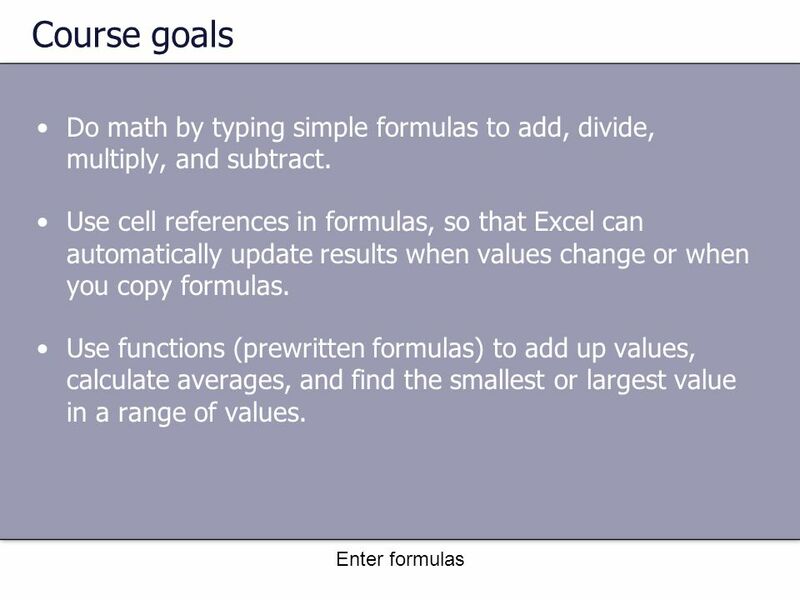 Overview: Simple calculations in Excel You’ll also learn how to use simple formulas that automatically update their results when values change. 4 Enter formulas Course goals Do math by typing simple formulas to add, divide, multiply, and subtract. 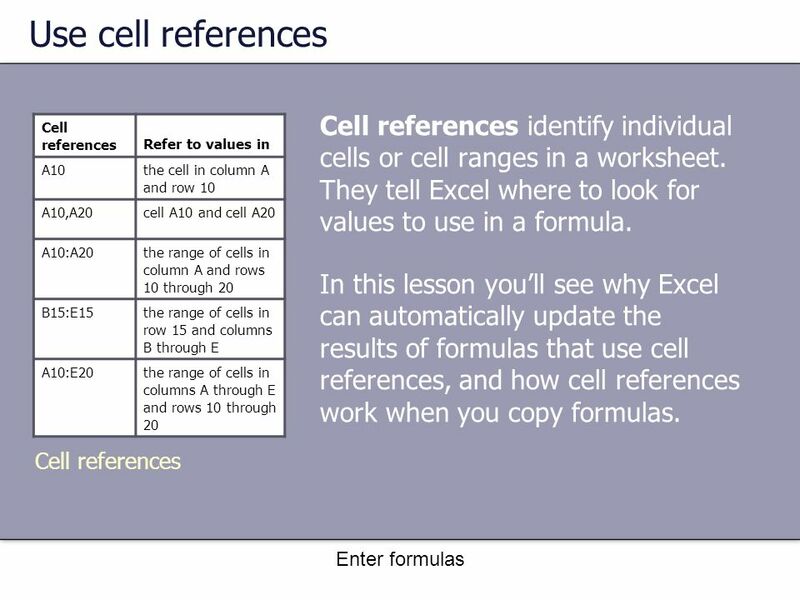 Use cell references in formulas, so that Excel can automatically update results when values change or when you copy formulas. Use functions (prewritten formulas) to add up values, calculate averages, and find the smallest or largest value in a range of values. 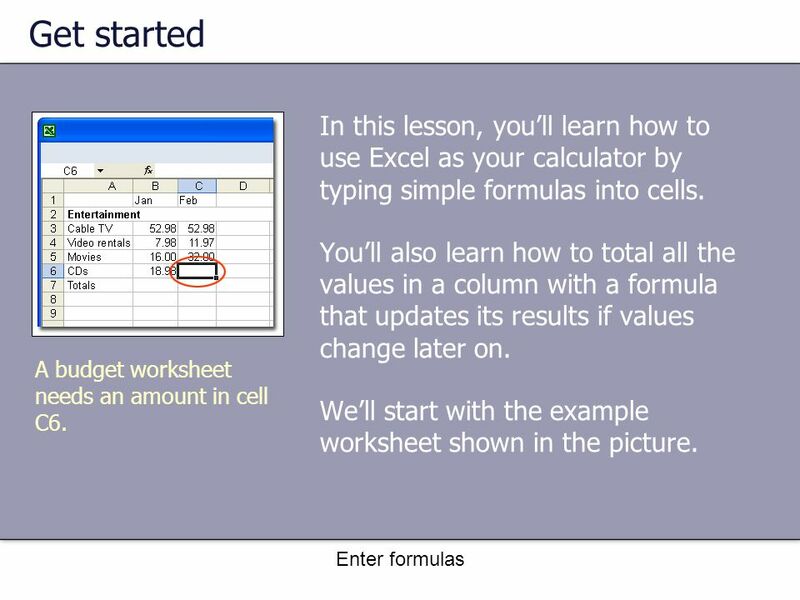 6 Enter formulas Get started In this lesson, you’ll learn how to use Excel as your calculator by typing simple formulas into cells. You’ll also learn how to total all the values in a column with a formula that updates its results if values change later on. We’ll start with the example worksheet shown in the picture. A budget worksheet needs an amount in cell C6. 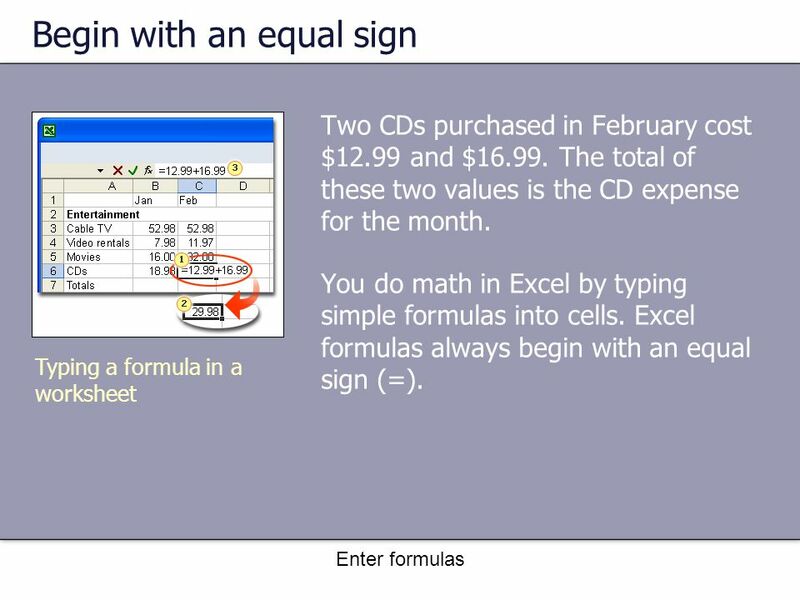 8 Enter formulas Begin with an equal sign Here’s how to add 12.99 and 16.99 in cell C6: Typing a formula in a worksheet 1.Type the formula =12.99+16.99. The plus sign (+) is a math operator that tells Excel to add the values. 2.Press ENTER to display the formula result, 29.98. 9 Enter formulas Begin with an equal sign Here’s how to add 12.99 and 16.99 in cell C6: Typing a formula in a worksheet 3.The formula appears in the formula bar near the top of the worksheet whenever you select cell C6. 12 Enter formulas Total all the values in a column To get your January total: 2.A colored marquee surrounds the cells in the formula, and the formula appears in cell B7. 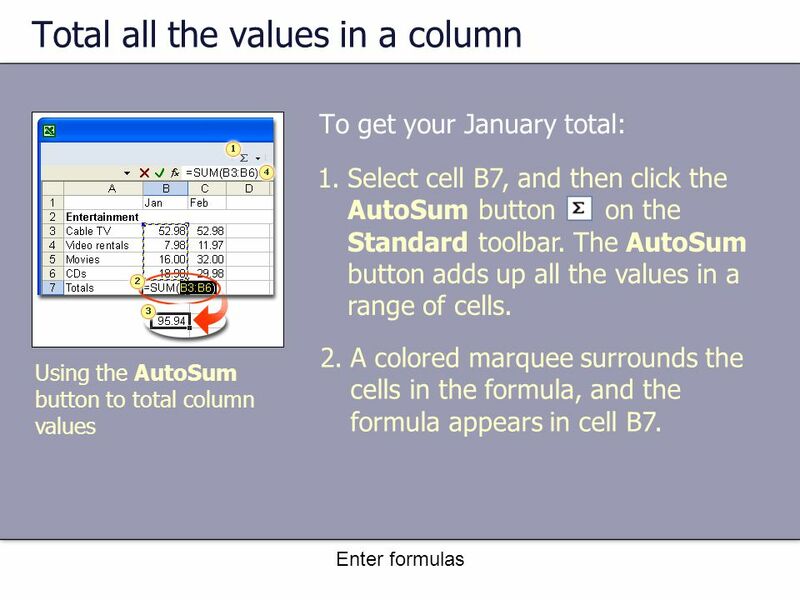 Using the AutoSum button to total column values 1.Select cell B7, and then click the AutoSum button on the Standard toolbar. The AutoSum button adds up all the values in a range of cells. 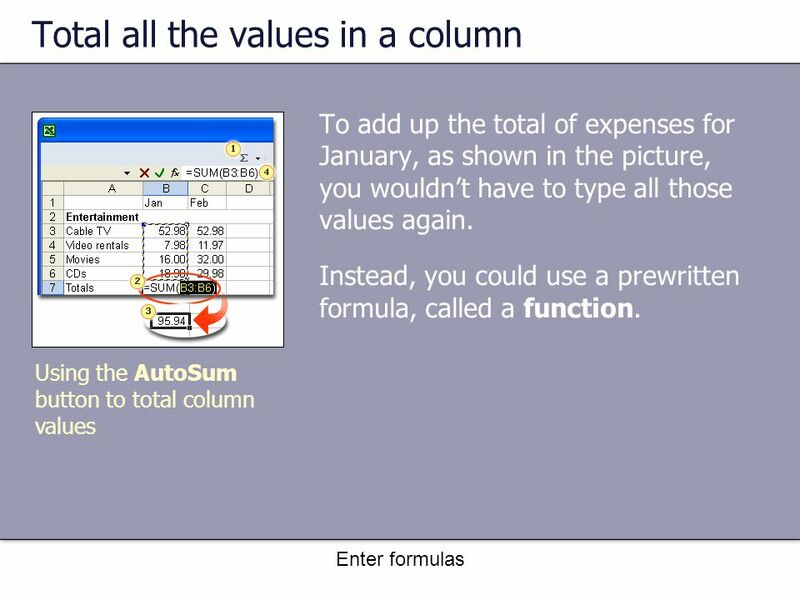 13 Enter formulas Total all the values in a column To get your January total: Using the AutoSum button to total column values 3.Press ENTER. This displays the SUM function result 95.94 in cell B7. 4.Select cell B7 to display the formula =SUM(B3:B6) in the formula bar. 14 Enter formulas Total all the values in a column B3:B6 is the information, called the argument, that tells the SUM function what to add. 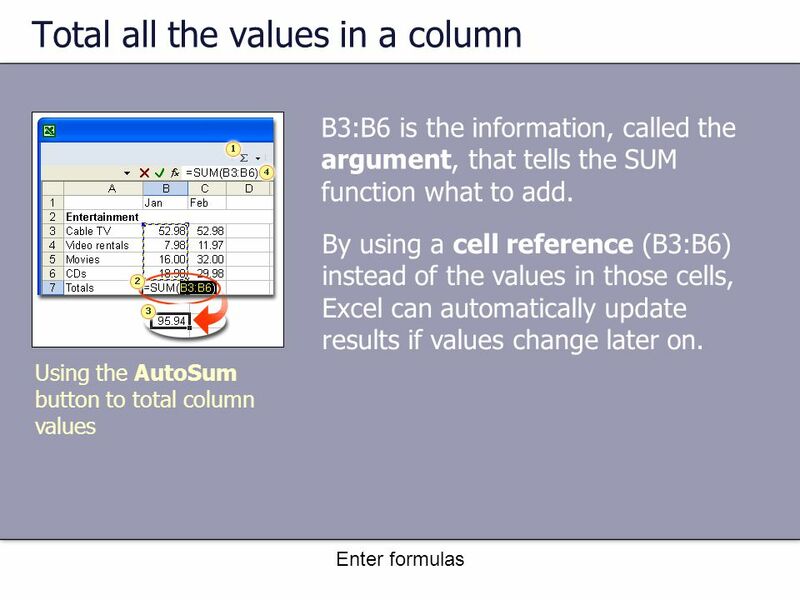 Using the AutoSum button to total column values By using a cell reference (B3:B6) instead of the values in those cells, Excel can automatically update results if values change later on. 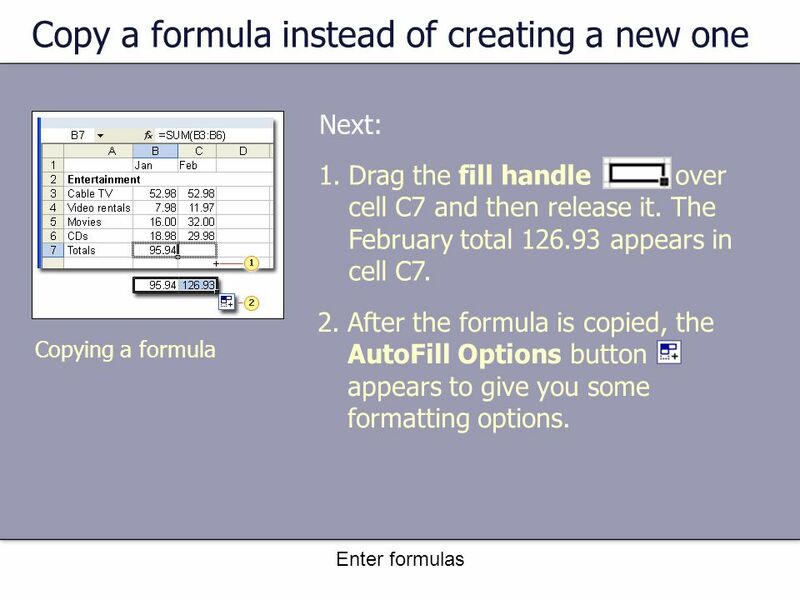 17 Enter formulas Copy a formula instead of creating a new one Next: Copying a formula 1.Drag the fill handle over cell C7 and then release it. The February total 126.93 appears in cell C7. 2.After the formula is copied, the AutoFill Options button appears to give you some formatting options. 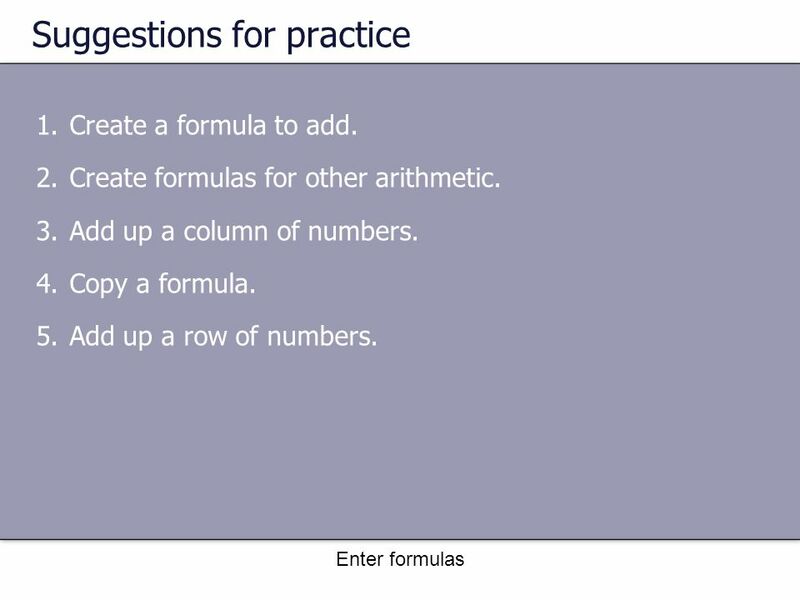 18 Enter formulas Suggestions for practice 1.Create a formula to add. 2.Create formulas for other arithmetic. 3.Add up a column of numbers. 4.Copy a formula. 5.Add up a row of numbers. 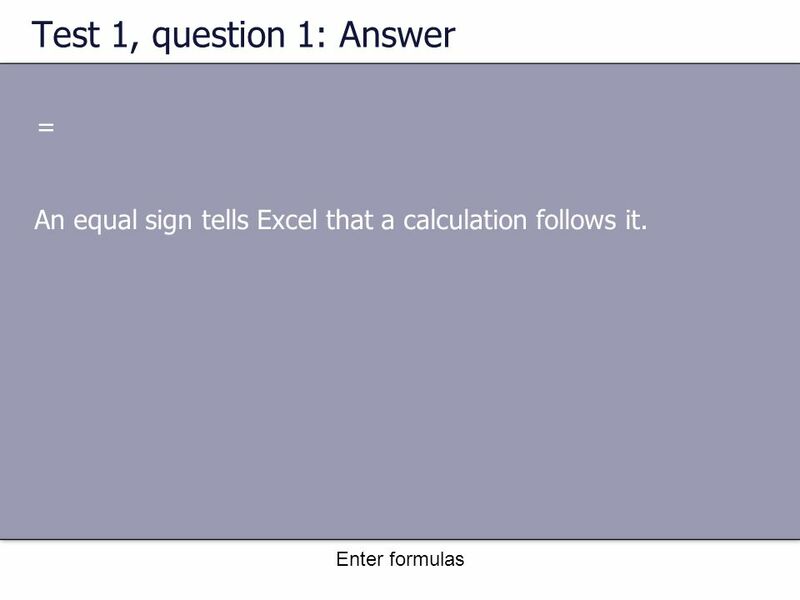 20 Enter formulas Test 1, question 1: Answer = An equal sign tells Excel that a calculation follows it. 21 Enter formulas Test 1, question 2 What is a function? (Pick one answer.) 1.A prewritten formula. 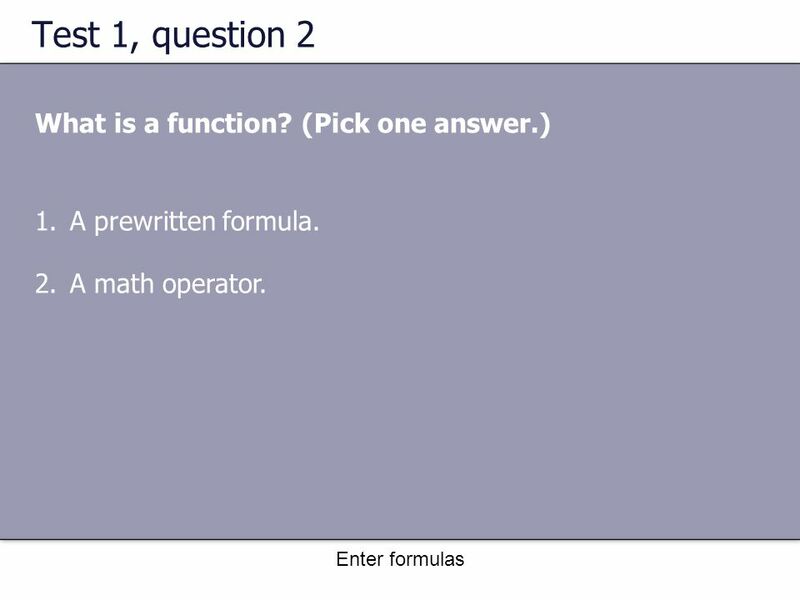 2.A math operator. 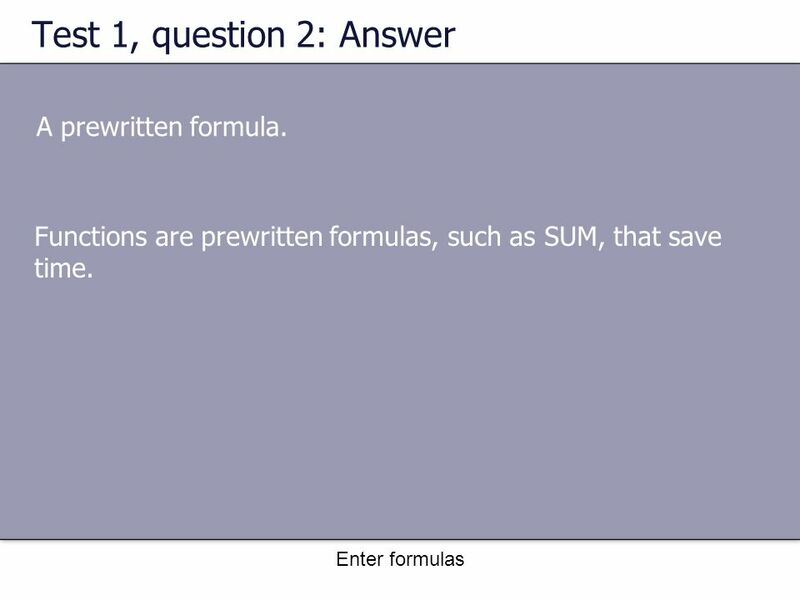 22 Enter formulas Test 1, question 2: Answer A prewritten formula. 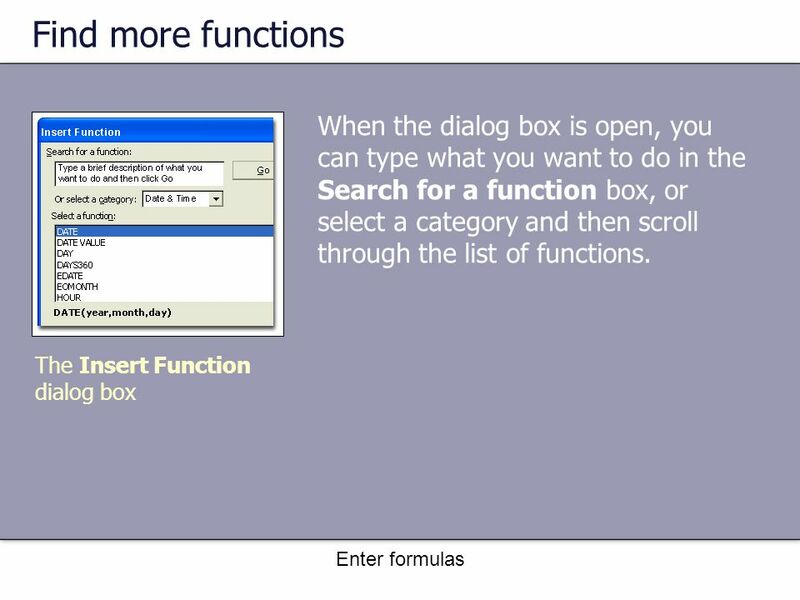 Functions are prewritten formulas, such as SUM, that save time. 23 Enter formulas Test 1, question 3 A formula result is in cell C6. You wonder how you got the result. To see the formula, you do which of the following? (Pick one answer.) 1.Select cell C6, and then press CTRL+SHIFT. 2.Select cell C6, and then press F5. 3.Select cell C6. 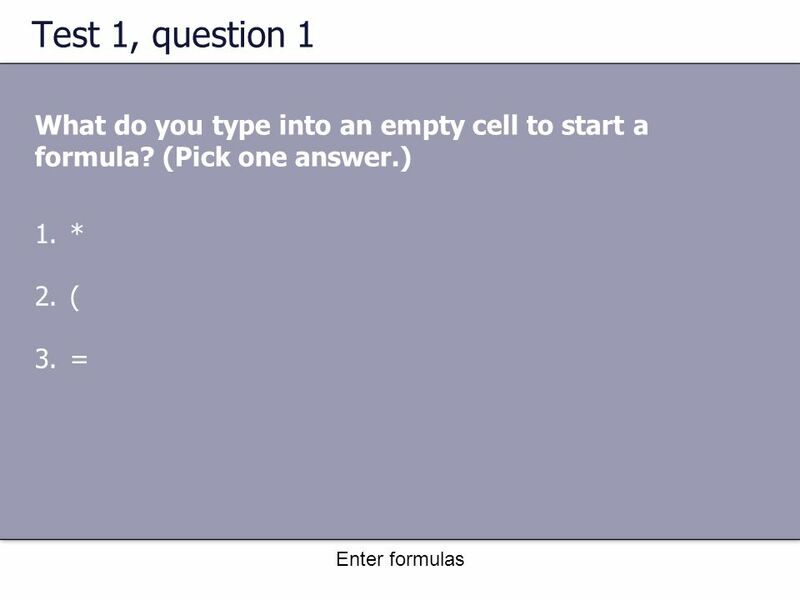 24 Enter formulas Test 1, question 3: Answer Select cell C6. It’s that simple. 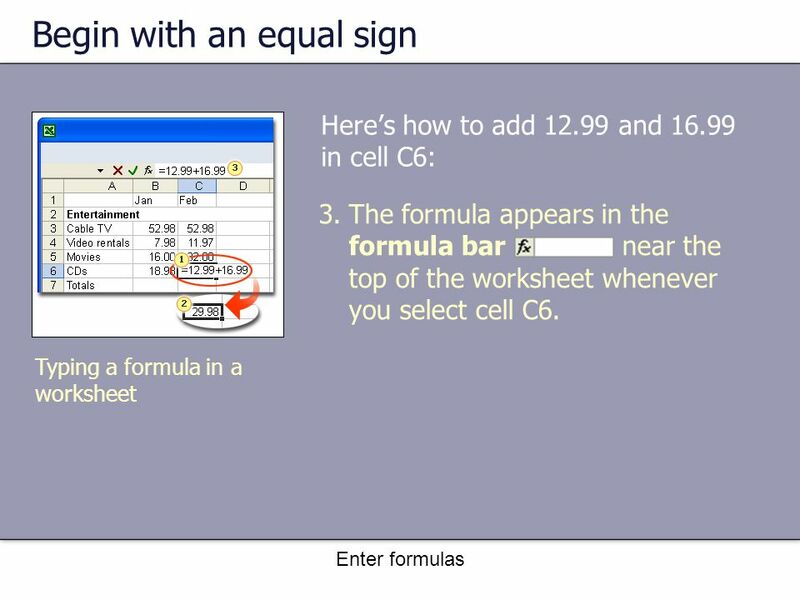 The formula is visible in the formula bar near the top of the worksheet whenever you select cell C6. 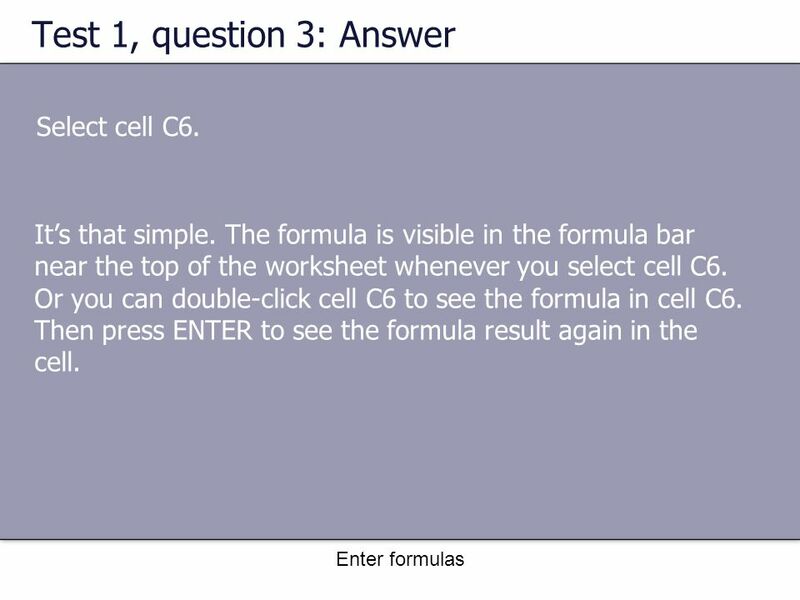 Or you can double-click cell C6 to see the formula in cell C6. Then press ENTER to see the formula result again in the cell. 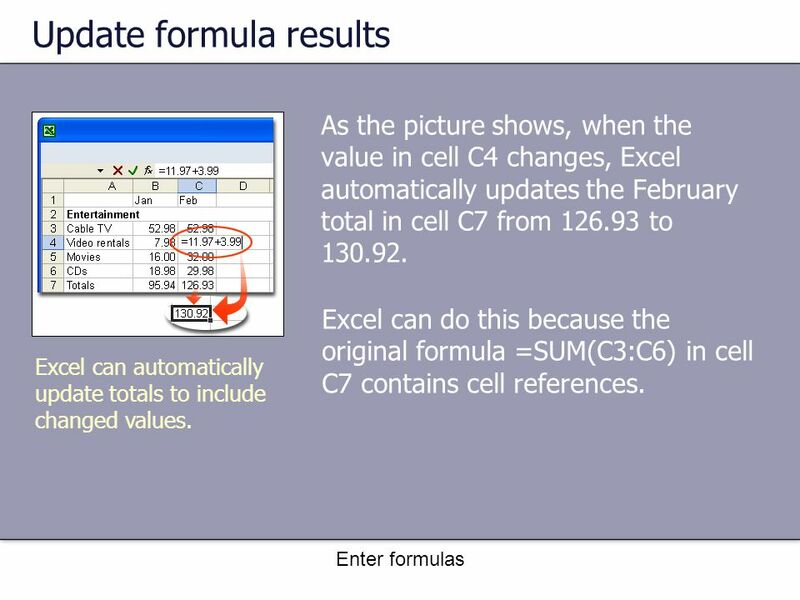 28 Enter formulas Update formula results As the picture shows, when the value in cell C4 changes, Excel automatically updates the February total in cell C7 from 126.93 to 130.92. Excel can automatically update totals to include changed values. 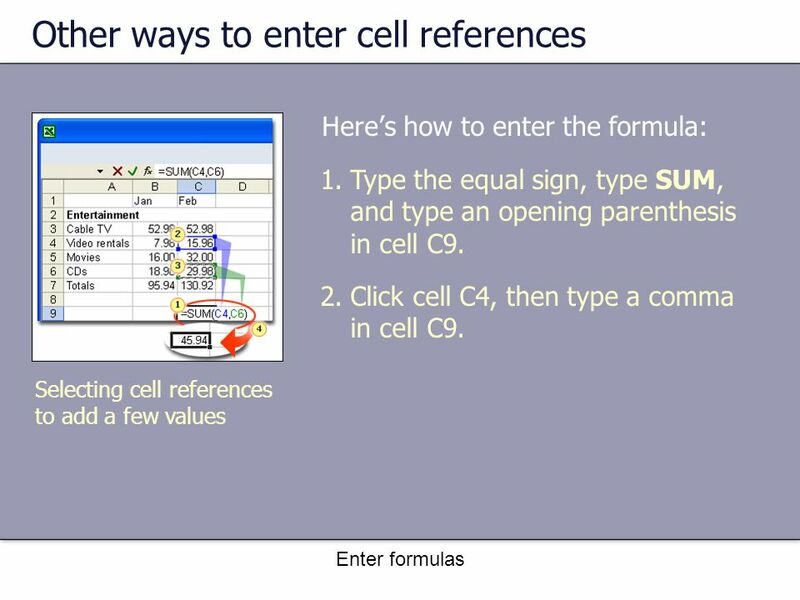 Excel can do this because the original formula =SUM(C3:C6) in cell C7 contains cell references. 29 Enter formulas Update formula results If you had entered 11.97 and other specific values into a formula in cell C7, Excel would not be able to update the total. Excel can automatically update totals to include changed values. 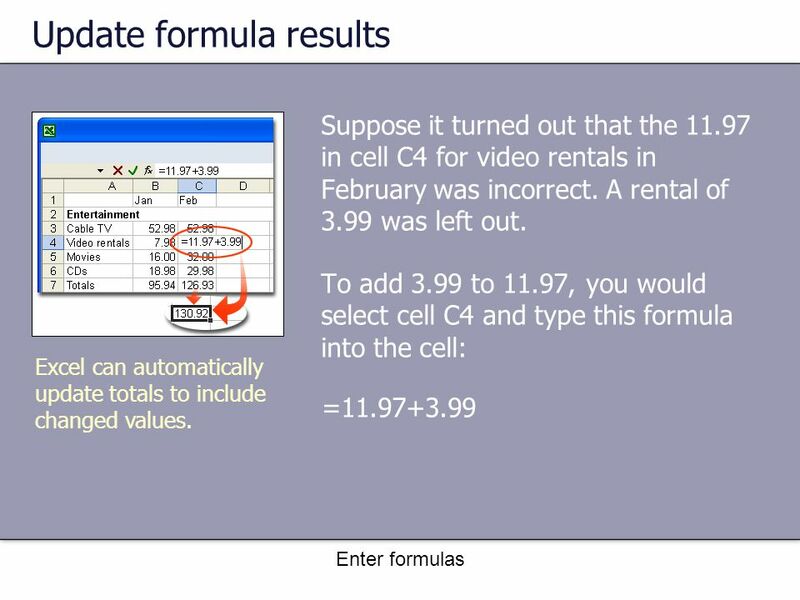 You’d have to change 11.97 to 15.96 not only in cell C4, but in the formula in cell C7 as well. 31 Enter formulas Other ways to enter cell references Imagine that you want to know the combined cost for video rentals and CDs in February. Selecting cell references to add a few values You don’t need to store the total, so you could enter the formula into an empty cell and delete it later. The example uses cell C9. 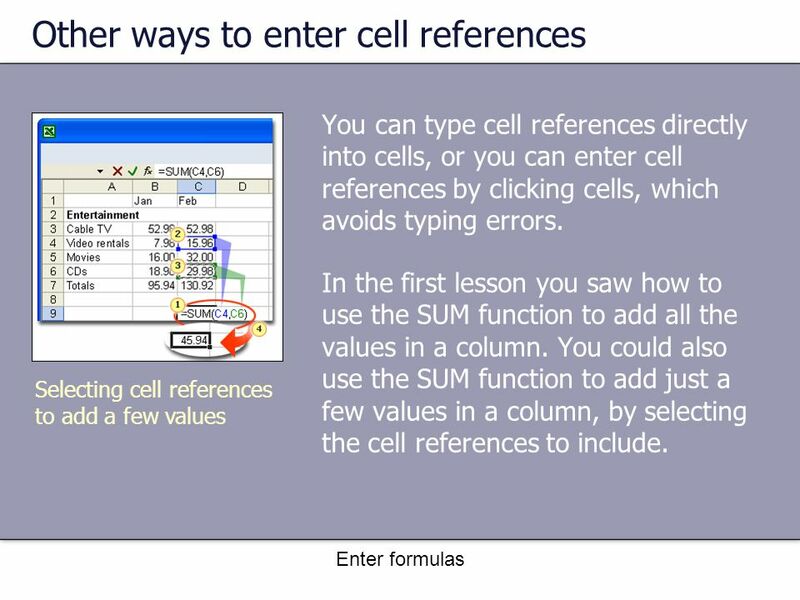 32 Enter formulas Other ways to enter cell references Here’s how to enter the formula: Selecting cell references to add a few values 1.Type the equal sign, type SUM, and type an opening parenthesis in cell C9. 2.Click cell C4, then type a comma in cell C9. 33 Enter formulas Other ways to enter cell references Here’s how to enter the formula: Selecting cell references to add a few values 3.Click cell C6. Then type a closing parenthesis in cell C9. 4.Press ENTER to display the formula result of 45.94. The arguments C4 and C6 tell the SUM function what values to calculate with. 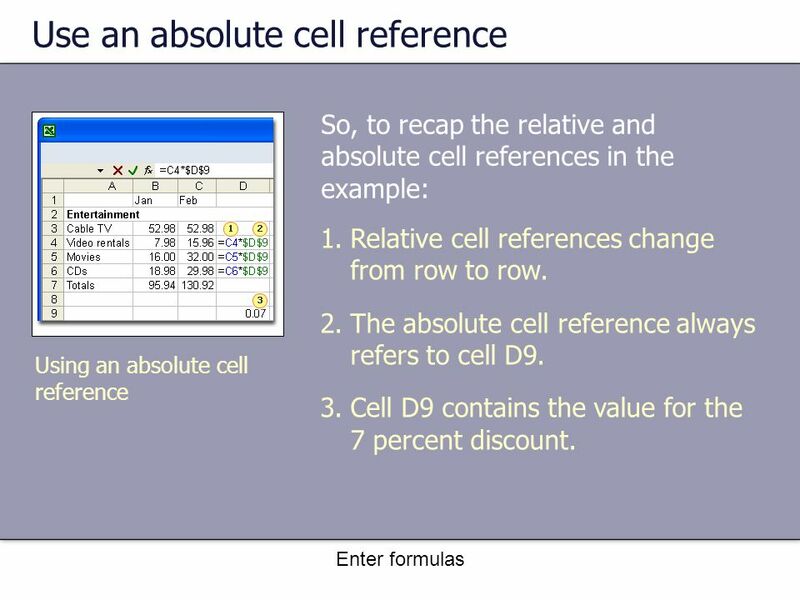 36 Enter formulas Reference types Relative and absolute cell references A mixed cell reference has either an absolute column and a relative row, or an absolute row and a relative column. 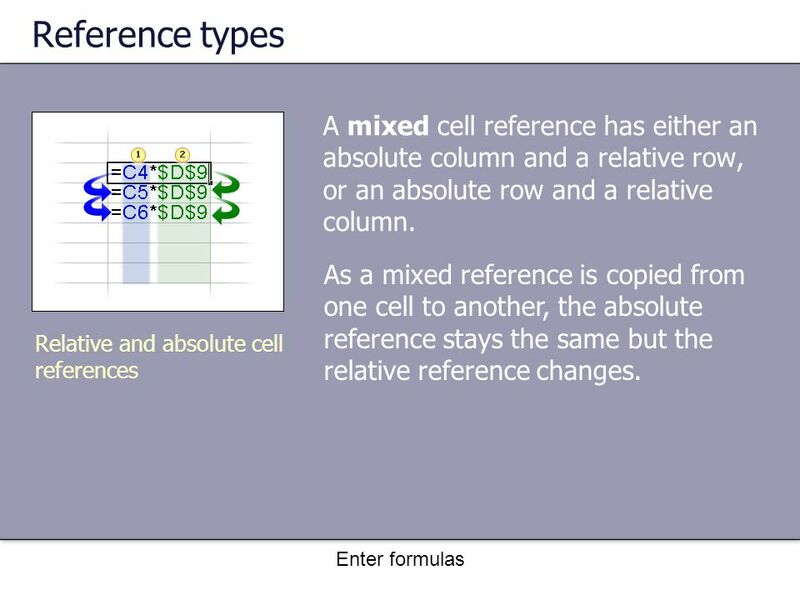 As a mixed reference is copied from one cell to another, the absolute reference stays the same but the relative reference changes. 38 Enter formulas Use an absolute cell reference Type the discount rate of 0.07 in the empty cell D9, and then type a formula in cell D4, starting with =C4*. Then enter a dollar sign ($) and D to make an absolute reference to column D, and $9 to make an absolute reference to row 9. 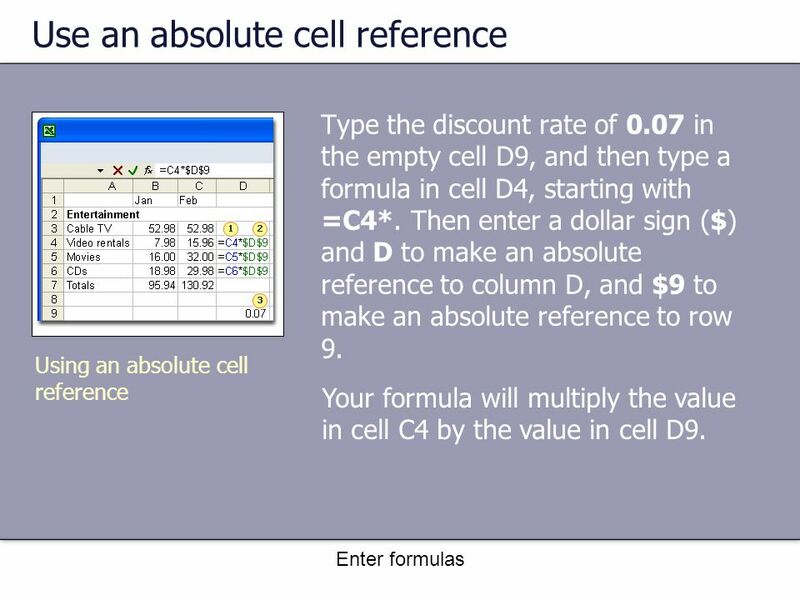 Using an absolute cell reference Your formula will multiply the value in cell C4 by the value in cell D9. 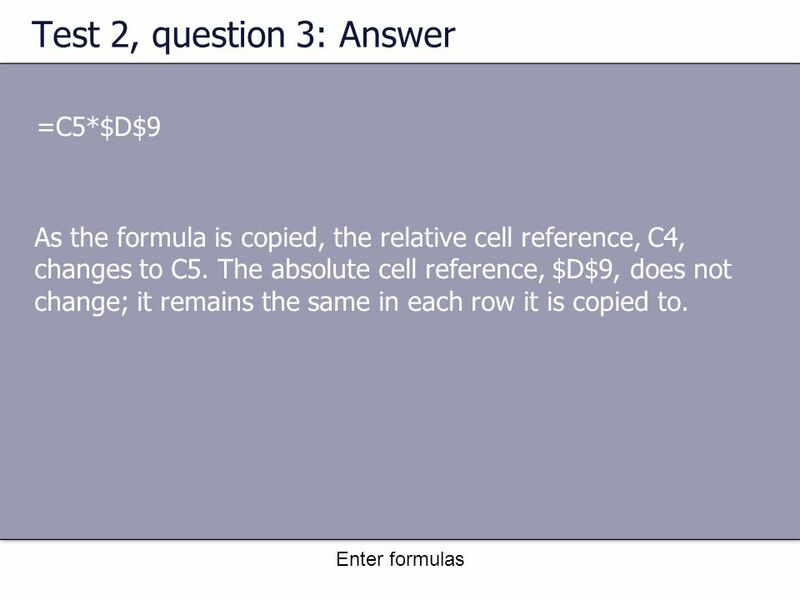 39 Enter formulas Use an absolute cell reference Next, copy the formula from cell D4 to D5 by using the fill handle. 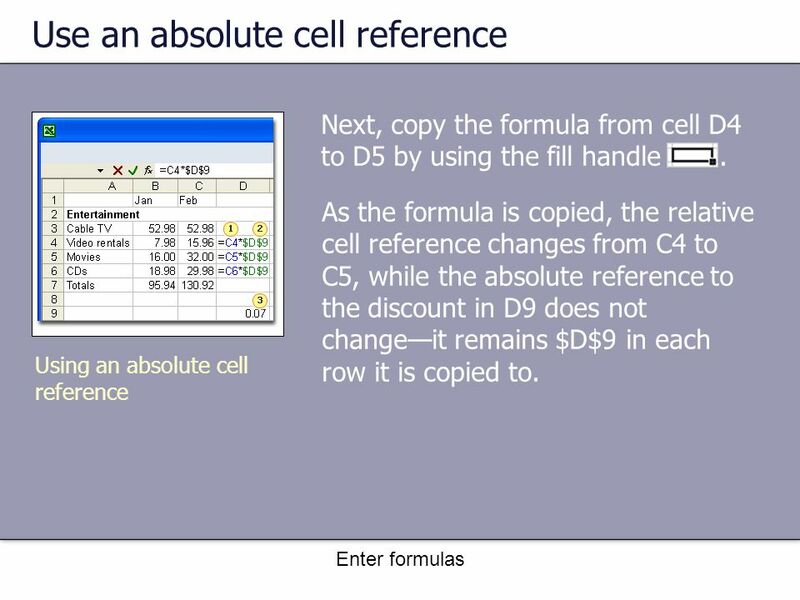 Using an absolute cell reference As the formula is copied, the relative cell reference changes from C4 to C5, while the absolute reference to the discount in D9 does not change—it remains $D$9 in each row it is copied to. 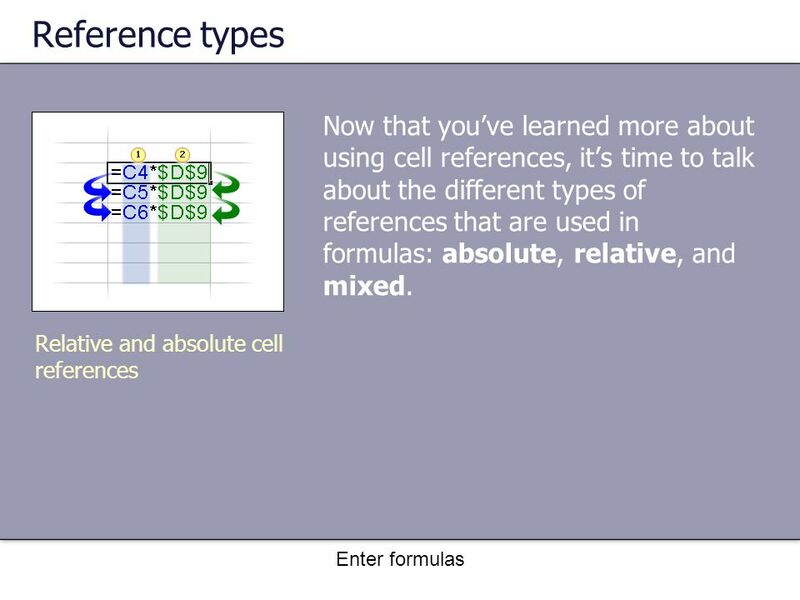 40 Enter formulas Use an absolute cell reference So, to recap the relative and absolute cell references in the example: Using an absolute cell reference 1.Relative cell references change from row to row. 2.The absolute cell reference always refers to cell D9. 3.Cell D9 contains the value for the 7 percent discount. 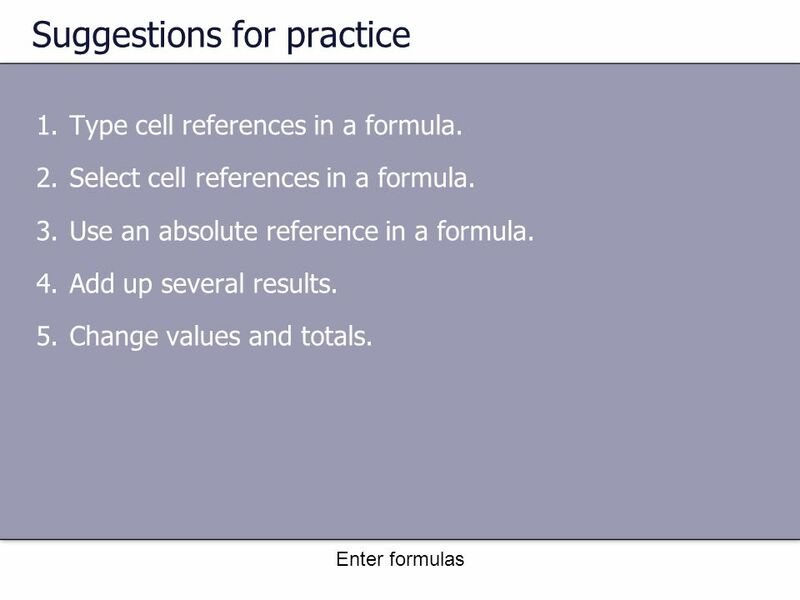 41 Enter formulas Suggestions for practice 1.Type cell references in a formula. 2.Select cell references in a formula. 3.Use an absolute reference in a formula. 4.Add up several results. 5.Change values and totals. 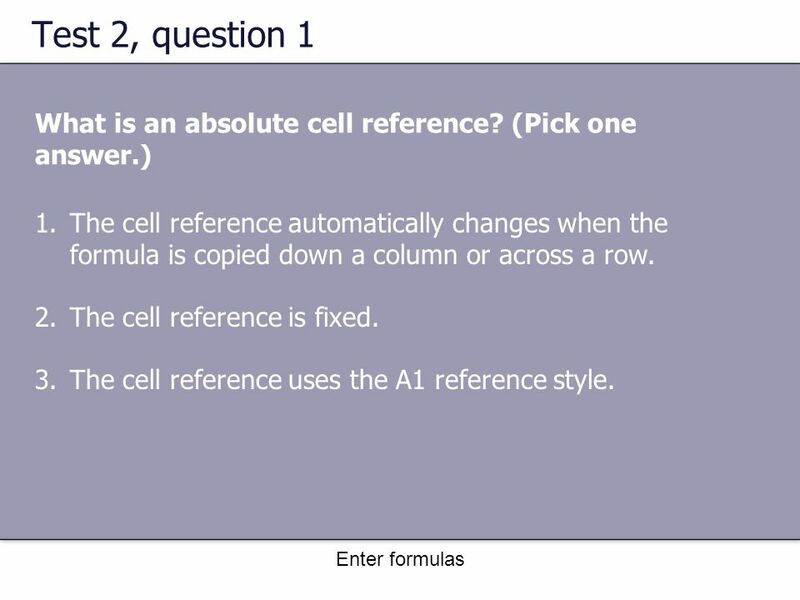 42 Enter formulas Test 2, question 1 What is an absolute cell reference? (Pick one answer.) 1.The cell reference automatically changes when the formula is copied down a column or across a row. 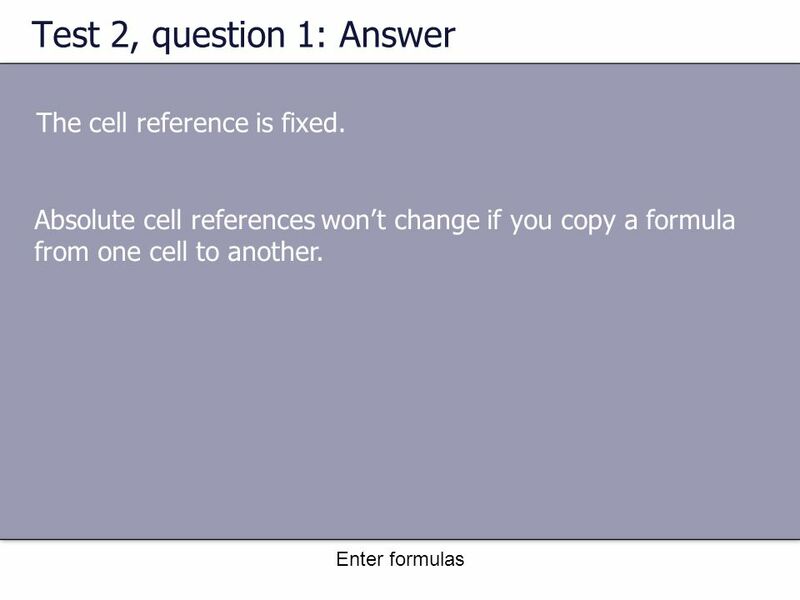 2.The cell reference is fixed. 3.The cell reference uses the A1 reference style. 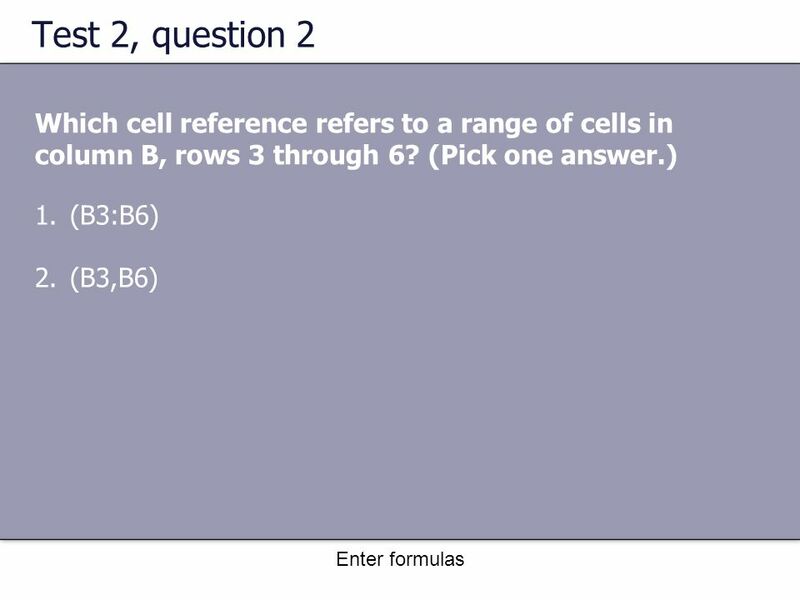 43 Enter formulas Test 2, question 1: Answer The cell reference is fixed. Absolute cell references won’t change if you copy a formula from one cell to another. 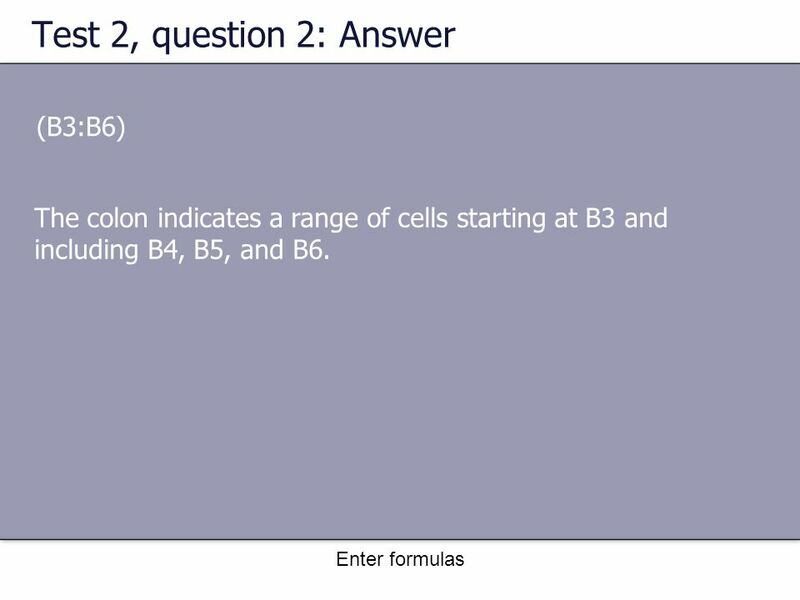 45 Enter formulas Test 2, question 2: Answer (B3:B6) The colon indicates a range of cells starting at B3 and including B4, B5, and B6. 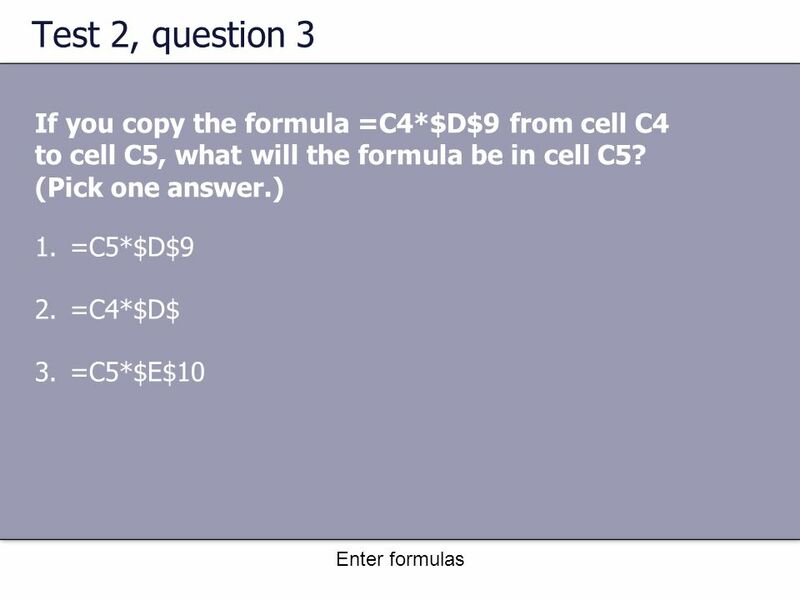 47 Enter formulas Test 2, question 3: Answer =C5*$D$9 As the formula is copied, the relative cell reference, C4, changes to C5. 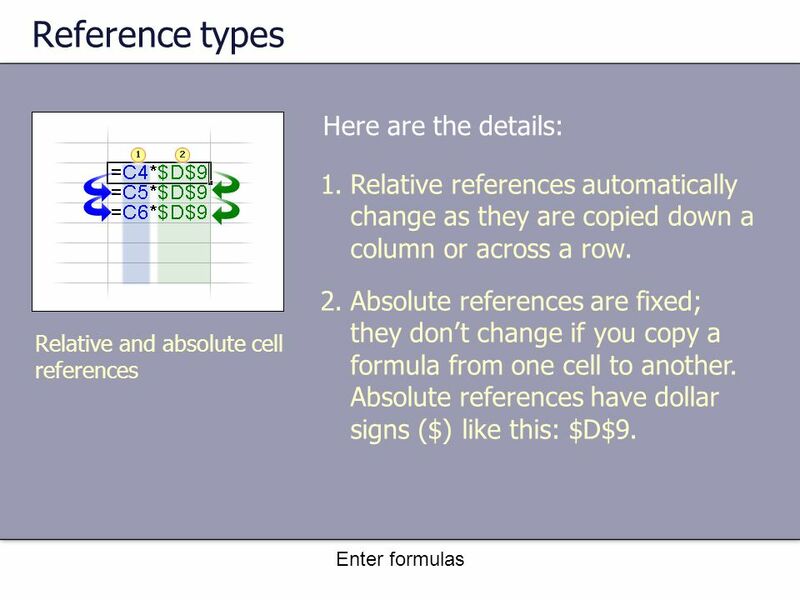 The absolute cell reference, $D$9, does not change; it remains the same in each row it is copied to. 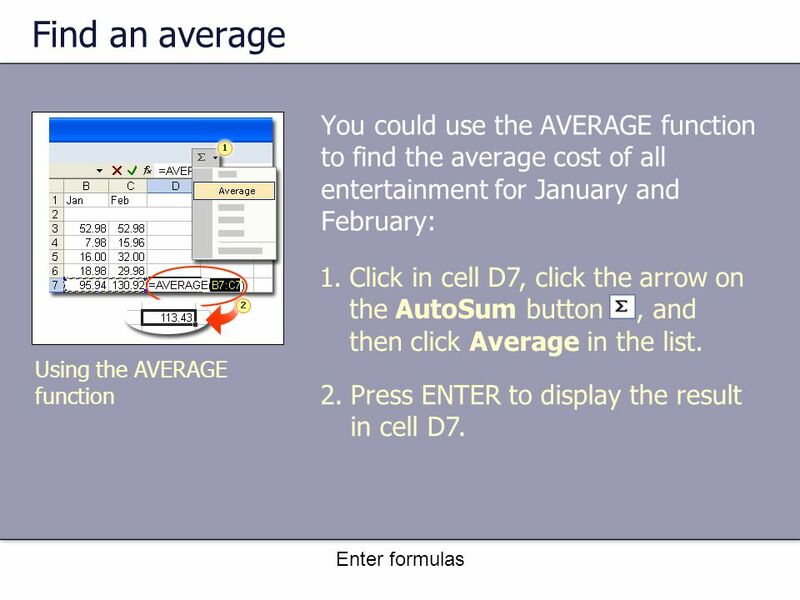 50 Enter formulas Find an average You could use the AVERAGE function to find the average cost of all entertainment for January and February: Using the AVERAGE function 1.Click in cell D7, click the arrow on the AutoSum button, and then click Average in the list. 2.Press ENTER to display the result in cell D7. 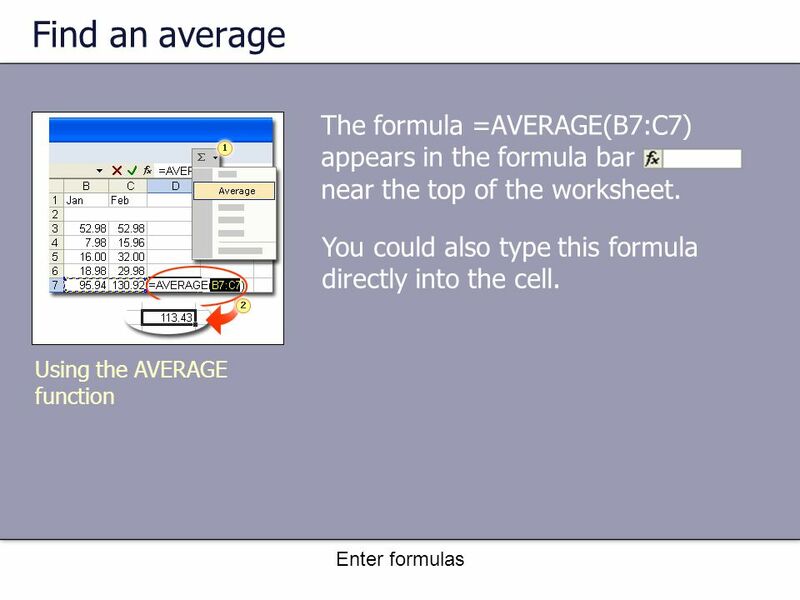 51 Enter formulas Find an average The formula =AVERAGE(B7:C7) appears in the formula bar near the top of the worksheet. Using the AVERAGE function You could also type this formula directly into the cell. 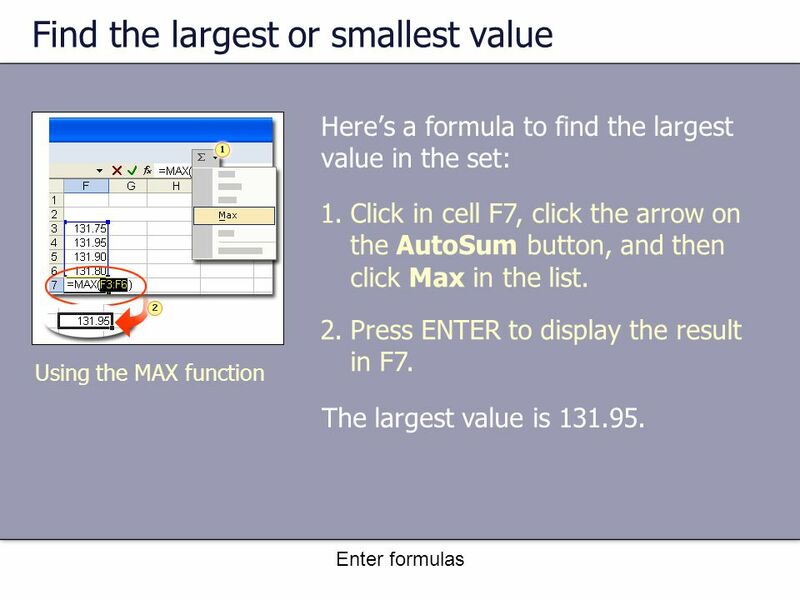 53 Enter formulas Find the largest or smallest value Here’s a formula to find the largest value in the set: Using the MAX function 1.Click in cell F7, click the arrow on the AutoSum button, and then click Max in the list. 2.Press ENTER to display the result in F7. The largest value is 131.95. 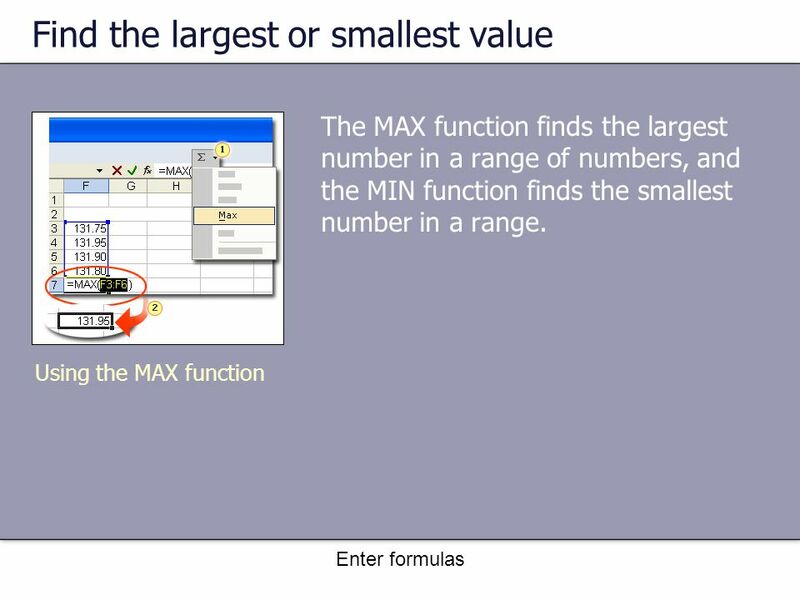 54 Enter formulas Find the largest or smallest value Finding the smallest value in the range is a similar process: You’d click Min in the list and press ENTER. Using the MAX function The smallest value would be 131.75. 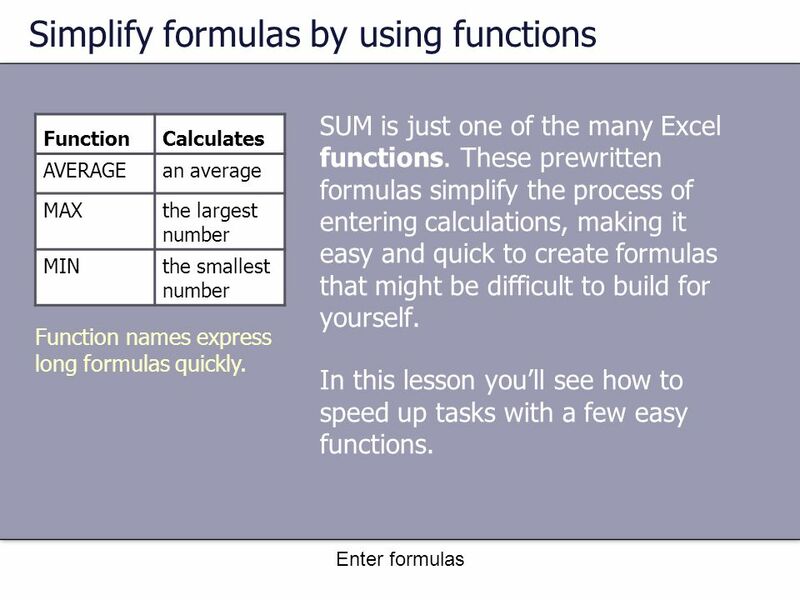 55 Enter formulas Print formulas You can print formulas to put up on your bulletin board to remind you how to create them. 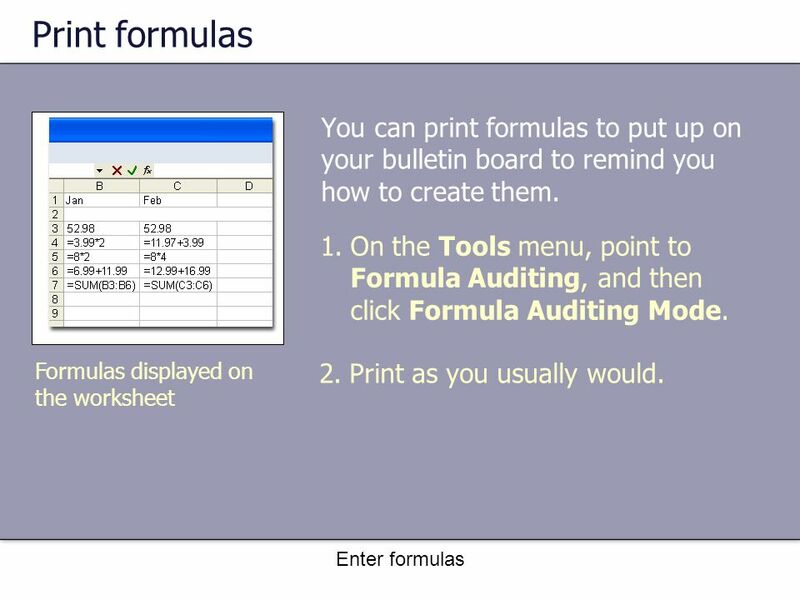 Formulas displayed on the worksheet 1.On the Tools menu, point to Formula Auditing, and then click Formula Auditing Mode. 2.Print as you usually would. 57 Enter formulas What’s that funny thing in my worksheet? Here are three common error values: The ##### error value ##### The column is not wide enough to display the contents of the cell. Increase column width, shrink the contents to fit the column, or apply a different number format. #REF! 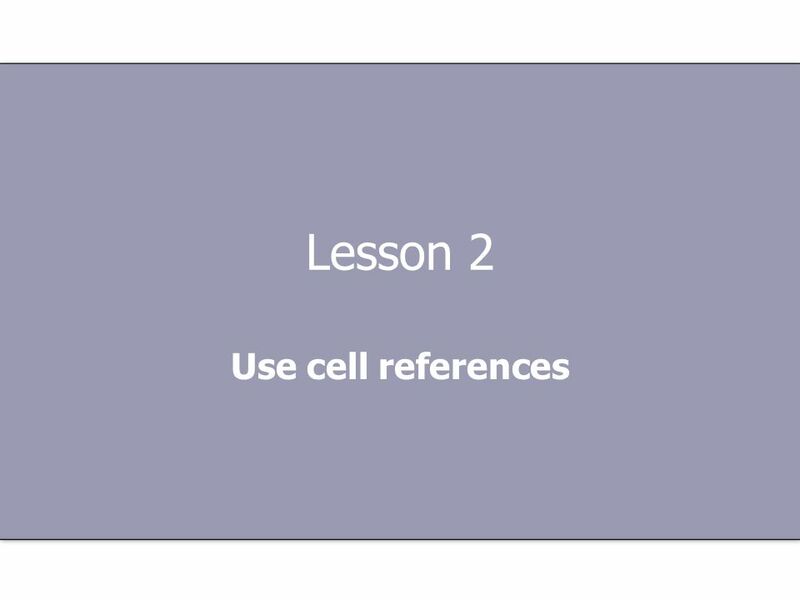 A cell reference is not valid. Cells may have been deleted or pasted over. 58 Enter formulas What’s that funny thing in my worksheet? Here are three common error values: The ##### error value #NAME? You may have misspelled a function name or used a name that Excel does not recognize. 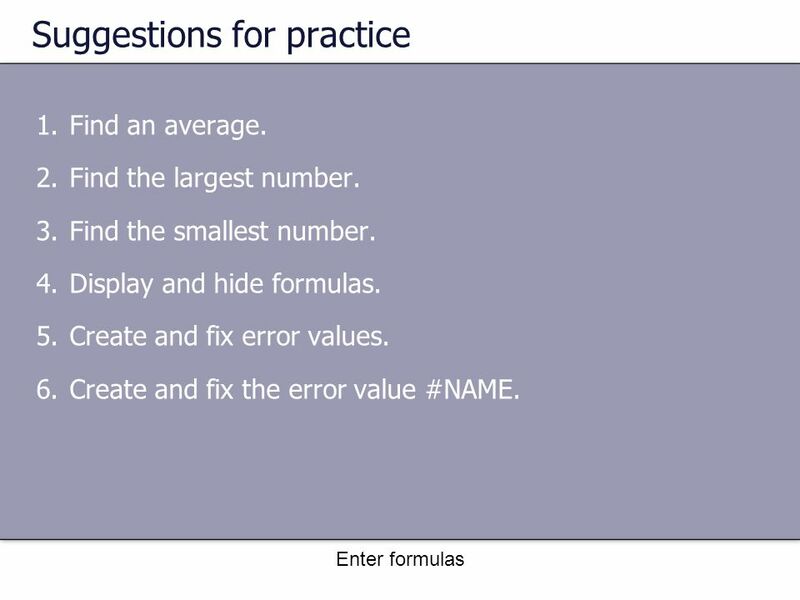 61 Enter formulas Suggestions for practice 1.Find an average. 2.Find the largest number. 3.Find the smallest number. 4.Display and hide formulas. 5.Create and fix error values. 6.Create and fix the error value #NAME. 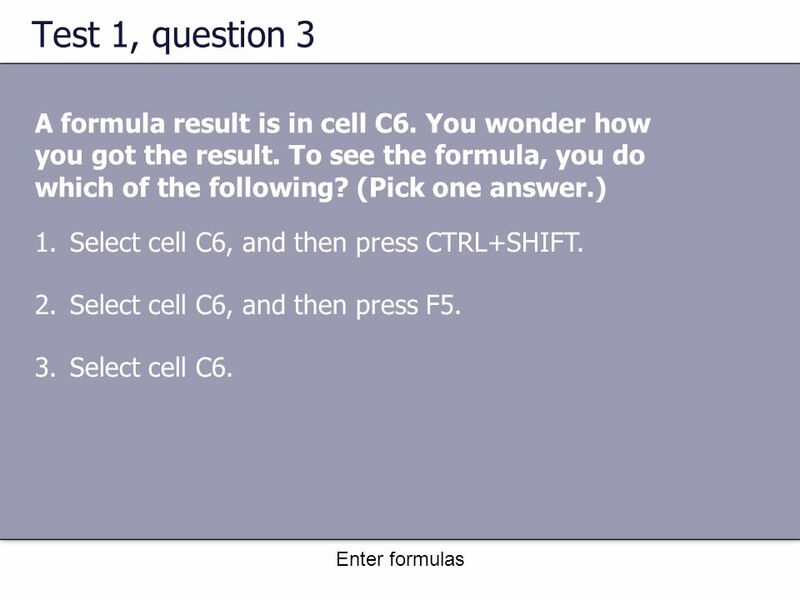 62 Enter formulas Test 3, question 1 How would you print formulas? (Pick one answer.) 1.Click Print on the File menu. 2.Click Normal on the View menu, and then click Print. 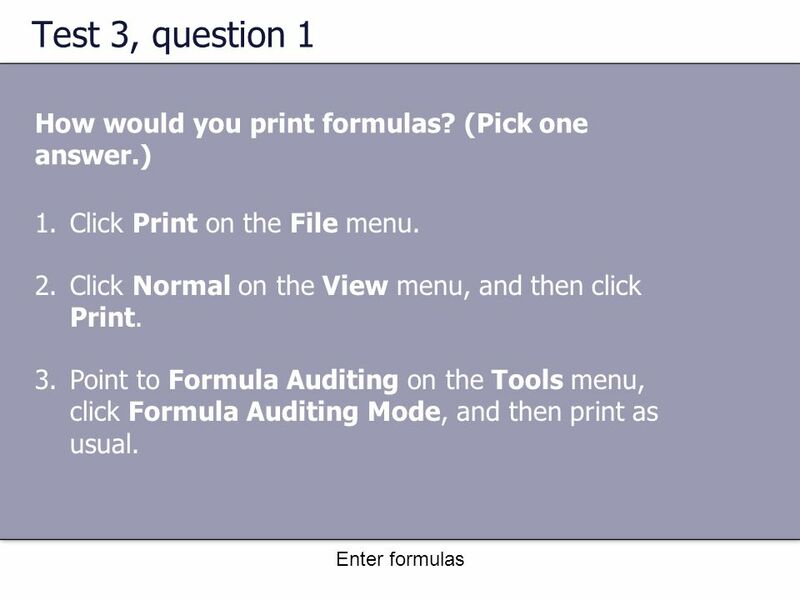 3.Point to Formula Auditing on the Tools menu, click Formula Auditing Mode, and then print as usual. 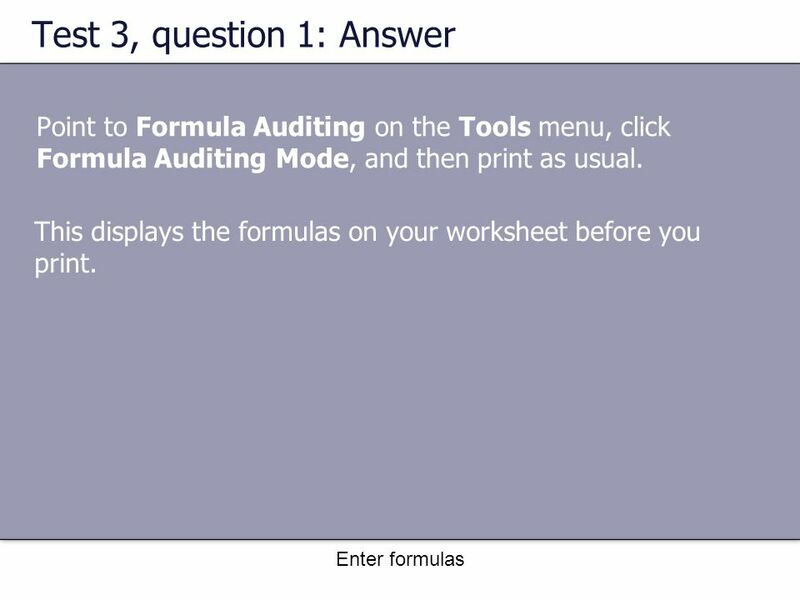 63 Enter formulas Test 3, question 1: Answer Point to Formula Auditing on the Tools menu, click Formula Auditing Mode, and then print as usual. 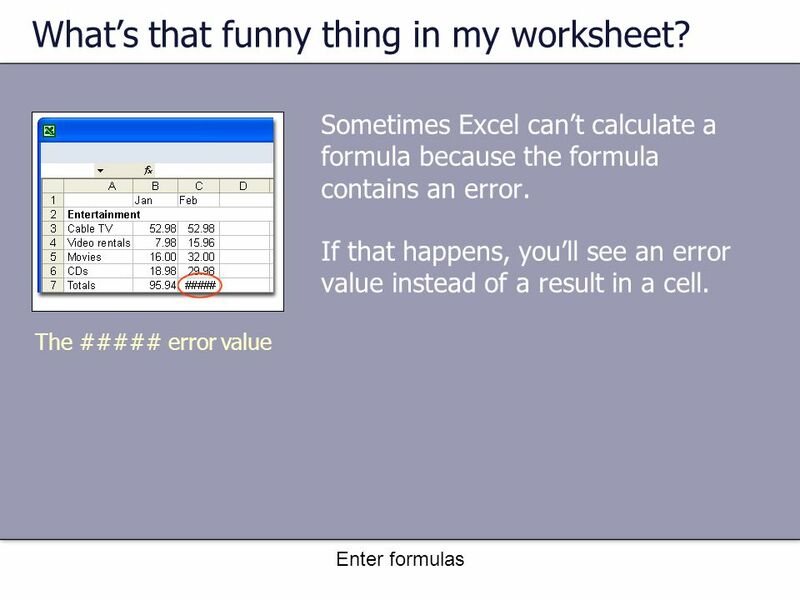 This displays the formulas on your worksheet before you print. 64 Enter formulas Test 3, question 2 What does ##### mean? (Pick one answer.) 1.The column isn’t wide enough to display the content. 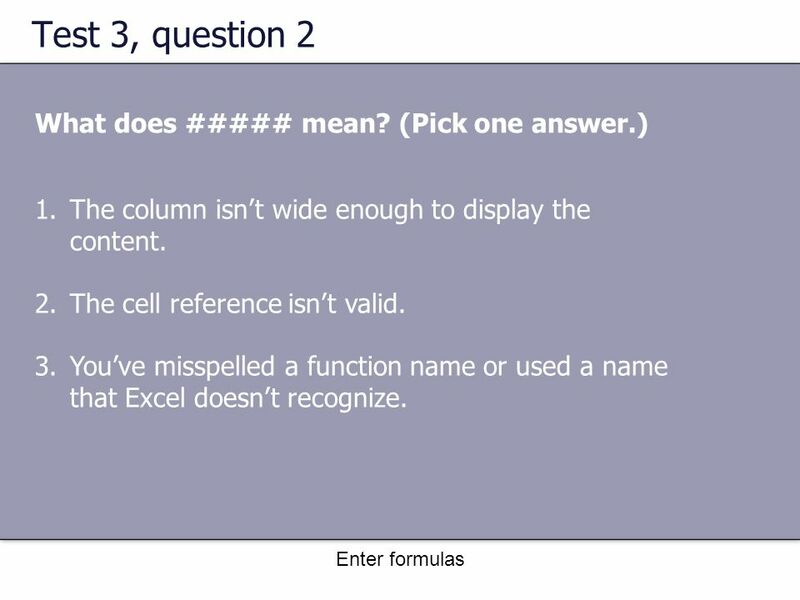 2.The cell reference isn’t valid. 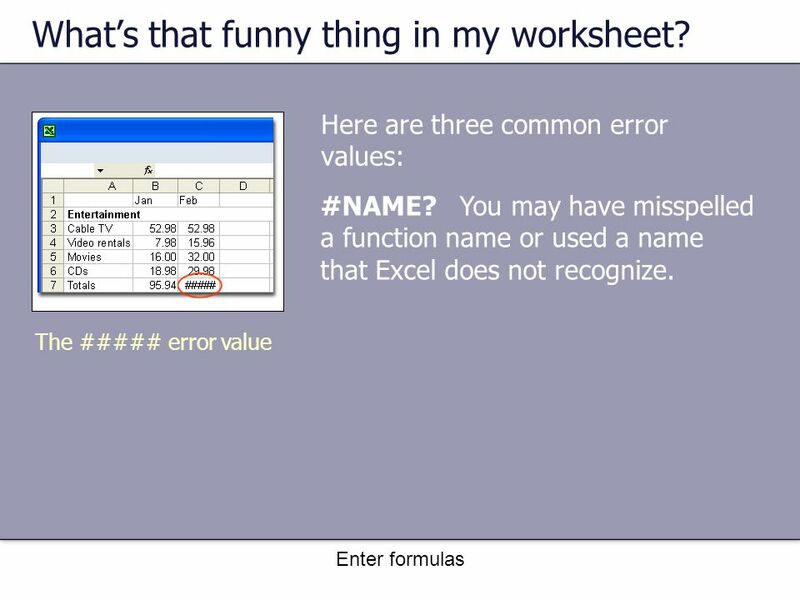 3.You’ve misspelled a function name or used a name that Excel doesn’t recognize. 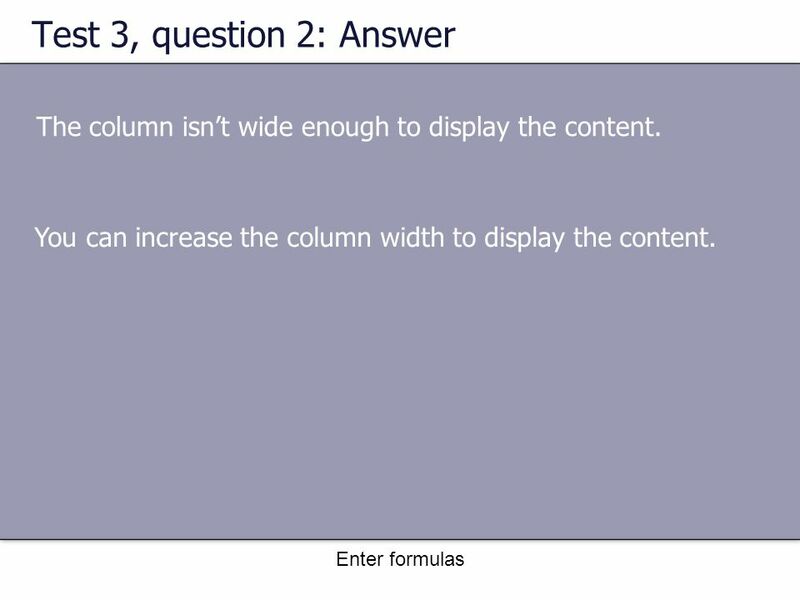 65 Enter formulas Test 3, question 2: Answer The column isn’t wide enough to display the content. You can increase the column width to display the content. 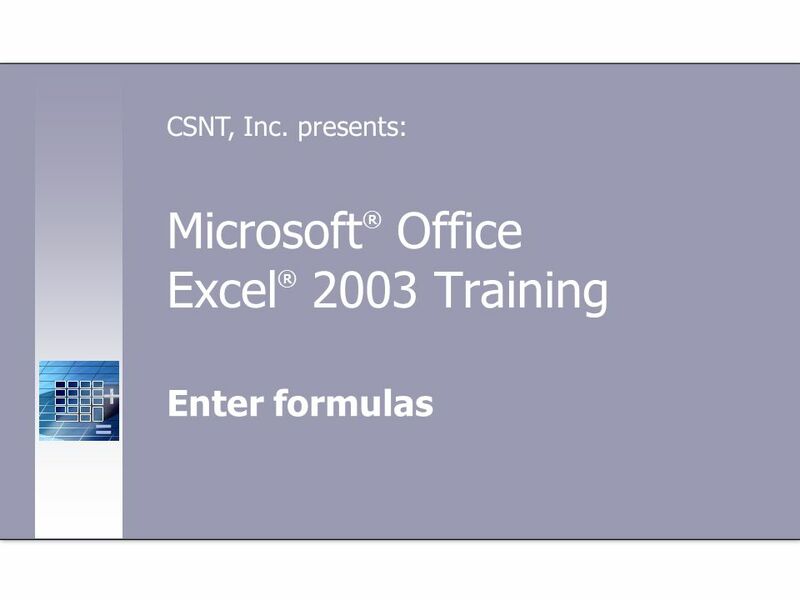 Download ppt "Microsoft ® Office Excel ® 2003 Training Enter formulas CSNT, Inc. presents:"
Introduction to Excel This class is “HANDS-ON” you will need to open up an excel spreadsheet and do examples as you go along. Students will be able to. Microsoft ® Office EXCEL 2007 BASIC Training HR Department. Enter formulas Simplify formulas by using functions Function names express long formulas quickly. 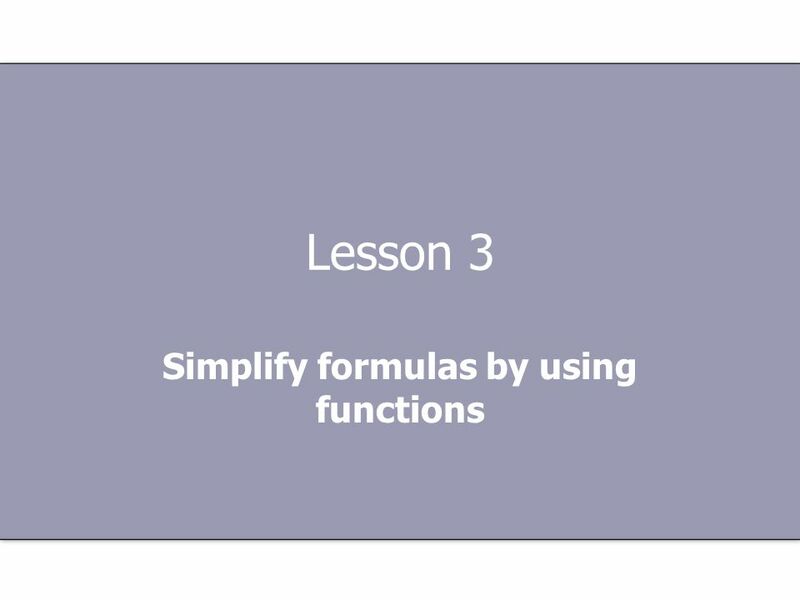 As prewritten formulas, functions simplify the process. EXCEL UNIT 2 Computer Technology Timpview High School. Lesson 3 Working with Formulas. Formulas, Ranges, and Functions. 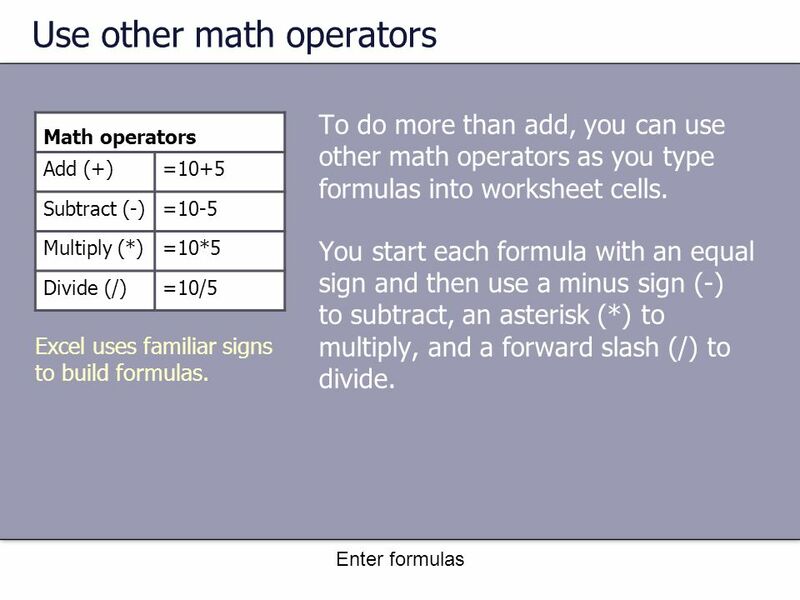 Formulas n Formulas perform operations such as addition, multiplication, and comparison on worksheet values. n Formulas. Enter formulas Use cell references Cell references identify individual cells or cell ranges in columns and rows. 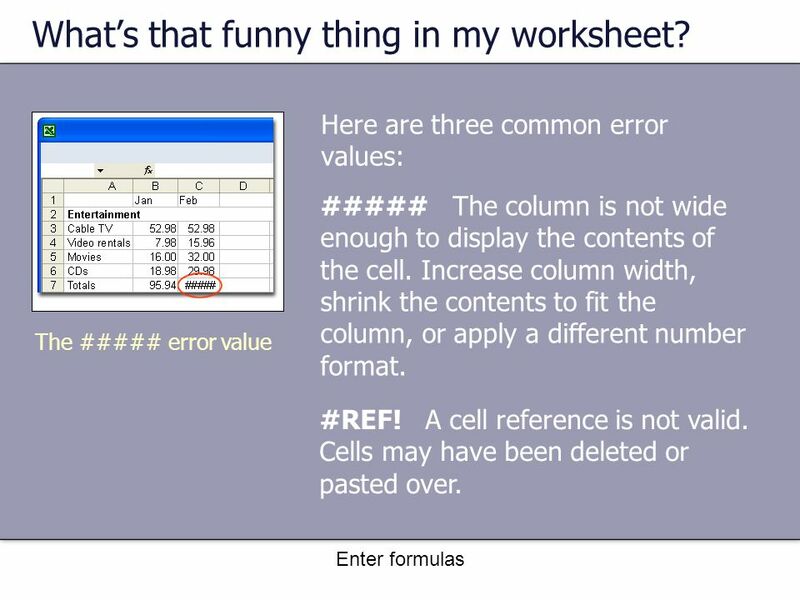 Cell references tell Excel where to look. Excel: Working With Formulas Cooperative Conversations January 12, 2007. 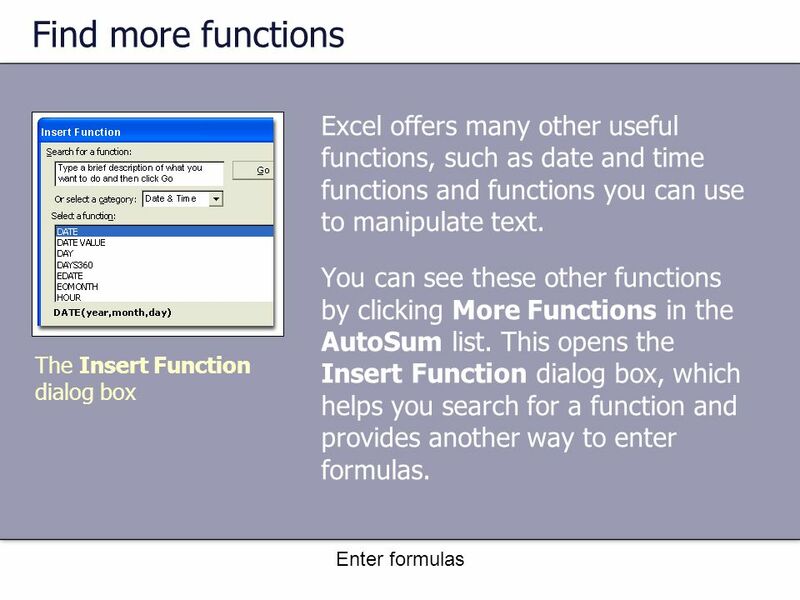 Introduction to Excel Formulas, Functions and References. Microsoft Office Illustrated Fundamentals Unit H: Using Complex Formulas, Functions, and Tables. 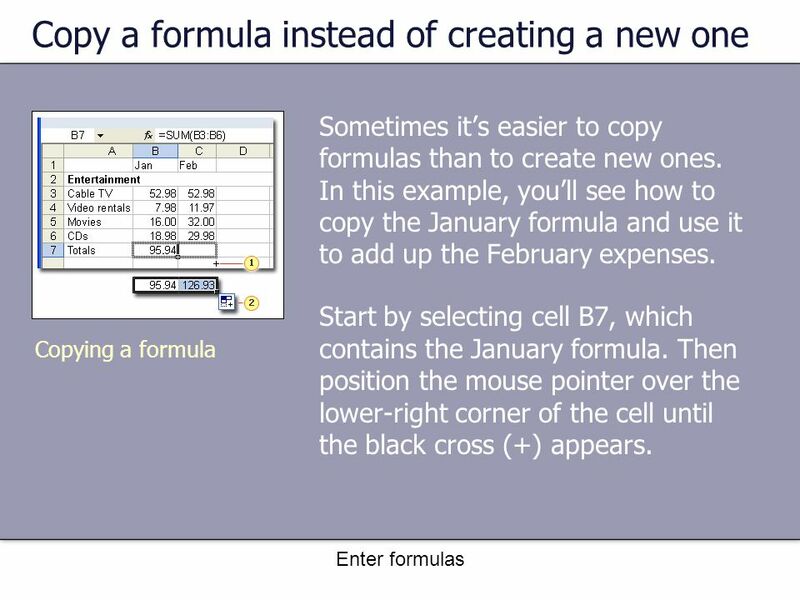 Using Basic FormulasUsing Basic Formulas Lesson 4 © 2014, John Wiley & Sons, Inc.Microsoft Official Academic Course, Microsoft Word Microsoft Excel. 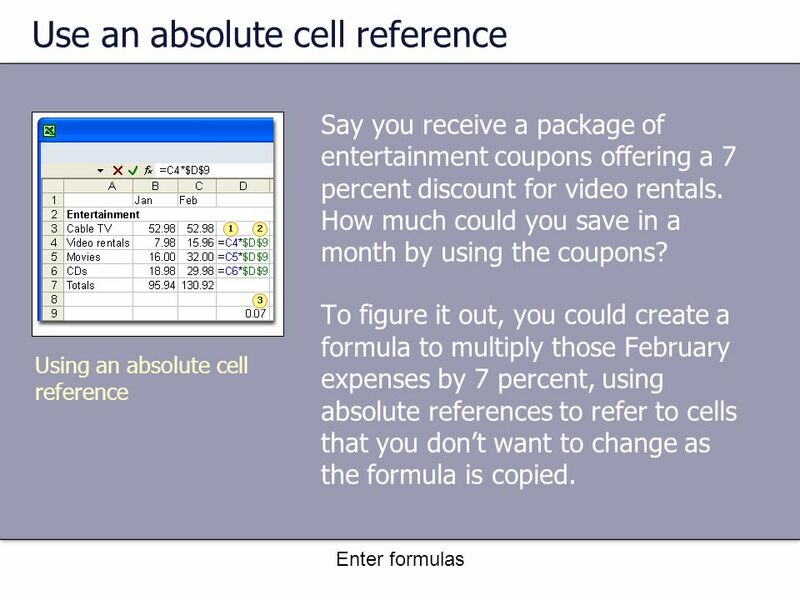 Enter formulas Get started Imagine that Excel is open and you’re looking at the “Entertainment” section of a household expense budget. Cell C6 in the worksheet. Formulas and Functions. 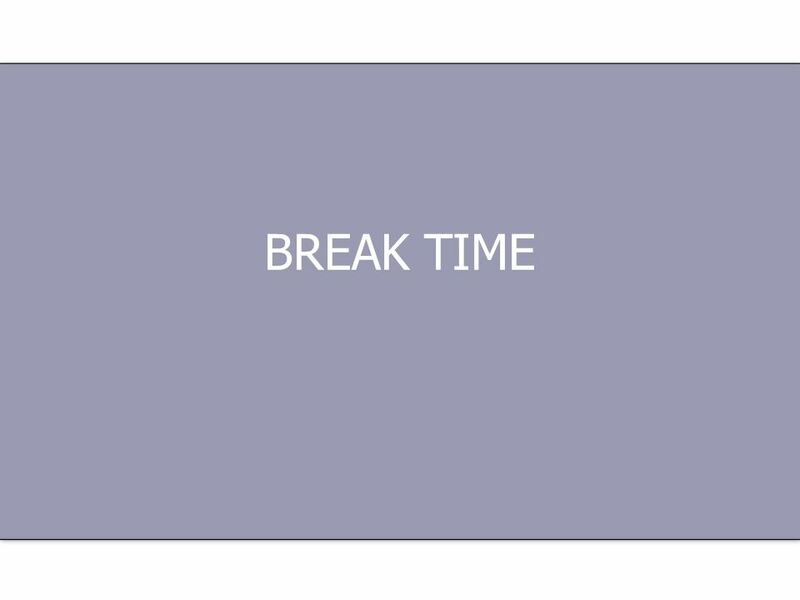 Type Data Into Spreadsheet ◦Open Excel ◦Create Blank Workbook ◦Type data shown as in example ◦ To get 2 lines in a cell ◦Type. Loading Excel Double click the Excel icon on the desktop (if you have this) OR Click on Start All Programs Microsoft Office Microsoft Office Excel 2003. EXCEL. 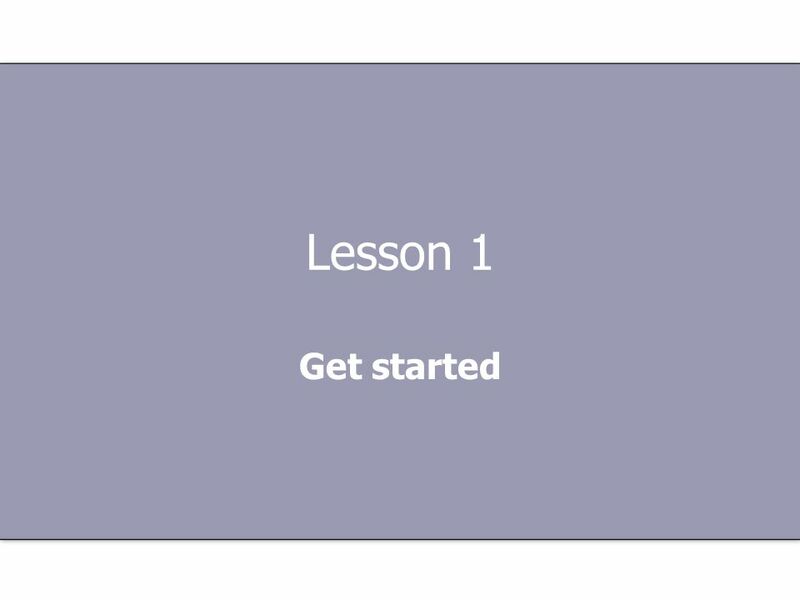 Lesson #1: Introduction to Spreadsheets  You will learn the basics about spreadsheets, cell addresses, rows/columns, and data entry.